Hard to believe it’s already 2015! How was everyone’s holiday? Around Christmas and holiday time, kids tend to get a lot of gifts. And the most common thing to get for kids, of course, is toys. But of course, the kind of toys kids like does vary a fair bit between countries. breaking it down into boy-aimed toys, girl-aimed toys, and toy shops! The most stereotypically boy-aimed toys in the States are probably action figures. Action figures are, essentially, characters in the form of dolls. with superhero action figures having long been among the most common types. especially figures from tokusatsu shows like Kamen Rider, etc. For the most part, American and Japanese action figures aren’t really all that different! キャラだけが異なる / The only difference is the characters. That said, there are some big differences as well. In both America and Japan, toys for play fighting are quite common. in Japan it seems that toy swords and the like are more of the norm. America having not been founded until after swords had been surpassed by guns as the standard for battle. In addition to that, on a general level toys for boys in Japan seem much more colorful than in America. Camo/army prints and similar designs are popular in the US, rather than toys with lots of flashing lights. If there were anything that’s an “action figure for girls”, it’d be the Barbie doll. regardless of if the brand actually is Barbie or not. In Japan, though, Barbie-type dolls don’t seem to be popular at all. and specifically noticed the lack of that kind of toy. 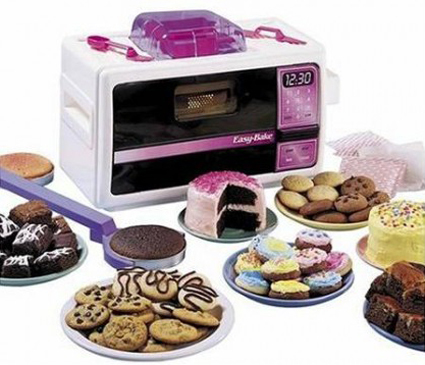 but what seems to be the most girl-oriented toy type in Japan is the “making toy”. Making toys are essentially just that - toys where you make things, i.e. jewelry, food, etc. but not in nearly as much quantity or variety as in Japan. both are centered around the idea of pretending to be an adult. whereas in Japan the fantasy is played out with just your own self. but what about the differences between the toy stores themselves? Definitely the most noticeable difference is the size. with narrow aisles and crowded shelves. American toy stores, on the other hand, tend to be pretty large. 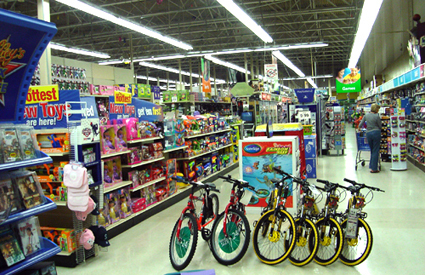 Toys’R’Us does exist in Japan, but it definitely wouldn’t be classified as ordinary. 広くないか？ / Pretty big, huh? The idea of buying used toys for your kids is pretty uncommon in Japan. In America, though, it’s not seen as unusual at all. A while back in 「第3回「買い物」/ #3 “Shopping”」, I talked about thrift stores, which are the main place to get used toys. 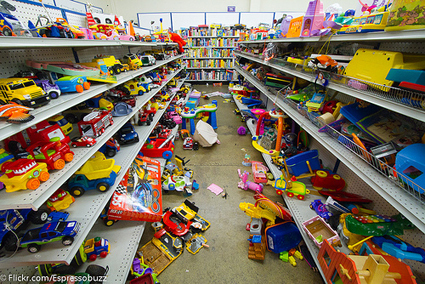 The drawback, though, is that a lot of the toys are broken, or not necessarily very clean. In Japan, storess like Hard Off are about the only places that sell used toys, so it’s definitely not an everyday sight. Here’s a track from my own label Allkore which features some sampling of a Robot Pitcher commercial! Playing with toys is fun even as an adult! Let’s have fun with toys ’till the end of our days! Till next time!